BBC Gardeners’ World Live and the BBC Good Food Show Summer return to the NEC next month. Take a look at what’s in store! 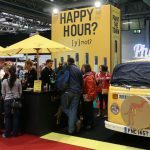 Discover the new food and drinks I sampled on my recent visit to the BBC Good Food Show, at the NEC in Birmingham in November 2017. Take a look ahead to the BBC Good Food Show at the Birmingham NEC, one of my favourite events of the year! When the BBC Good Food Show opens at the NEC each November, it really feels like Christmas is just around the corner. So last weekend, I headed down the M6 to Birmingham to take a look around. The BBC Good Food Show opens tomorrow at the NEC in Birmingham, a clear sign that Christmas is almost here! The weather might not have felt much like Summer, but Lyle and I had a great day out at the Shrewsbury Food Festival last weekend. The Good Food Show Summer is always a great way to spend a day. Take a look at my favourite stands from this year’s show. After last week’s visit to the NEC in Birmingham, I’m staying closer to home this weekend for the fourth Shrewsbury Food Festival. Last weekend I went along to the Gardener’s World Live and Good Food Show Summer exhibitions at the NEC in Birmingham. I always look forward to June – it’s time for the Gardeners’ World Live and Good Food Summer show at the NEC in Birmingham.